The Russian Federal Air Transport Agency has issued a warning to operators, authorities and manufacturers about ice crystal icing on jet engines, following a serious incident involving a Boeing 747-800. The Federal Air Transport Agency ‘Rosaviatsia’ is investigating a serious incident that occurred on July 31, 2013. A Boeing 747-8HVF cargo plane, operating AirBridgeCargo flight ABW349 to Hong Kong and Chicago-O’Hare Airport, encoutered severe weather while descending towards Hong Kong. At FL120 ice formed on the unheated parts of the high-pressure compressors. Breaking loose, the ice clumps were ingested, causing engine surges. Two engines had to be shut down. 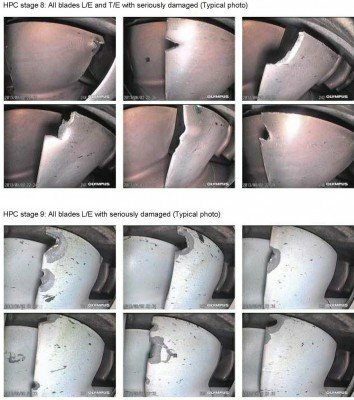 A safe landing was made at Hong Kong were significant damage was found on the high pressure compressors of engines nr. 1,2 and 4. The airplane has four General Electric GEnx-2B67 engines. Russian authorities are working with the FAA and EASA on the development of possible additional measures to change the design of engines and recommendations for crews’ actions in such circumstances. Representatives of AirBridgeCargo believe that contributing to the cause of the incident was the lack of appropriate icing warning of certain elements in the design of the engine high pressure compressor.